Women are dying in their millions. Some blame scientists, some see the hand of God. Would you let your daughter die if it would save the human race? 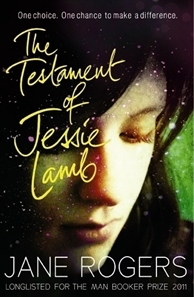 The Testament of Jessie Lamb is the story of one daughter's heroism and one father's love. This book is a bit of a change for me this year. It is technically categorised as Contemporary fiction (an adult genre), but I think it’s a good cross over read for teenage readers. It was even longlisted for the Man Booker prize, a list I never expected to read from at all this year. Set in the not so distant future, the female population is being struck down by a deadly virus, MDS, Maternal Death Syndrome. It only affects women who are pregnant, it kills them, and as a result, kills their unborn child. As you can imagine, the result is devastating, the entire population will be wiped out, as no children are able to be born. Jessie is 16, about to leave High School, looking forward to her future. The MDS virus has made her start to think more deeply about the world we live in, and how the actions of everyone on the planet have resulted in this disaster. She becomes involved in an activist group of teens with similar beliefs, and they believe that treating the planet more kindly may not cure MDS, but at least it shows that people are willing to change. When the activism loses it's appeal to Jessie, she finds another way to make a difference. The story is split into present day and then days leading up to the present day. In the opening chapter we see Jessie locked in a room, her feet chained, and a bucket for a toilet. Her Dad has locked her in here…we just don’t know why yet. Scientists have found a way that they can save the babies, but the mothers will still die. There are a group of girls calling themselves the Sleeping Beauties, who have made the ultimate sacrifice. They have volunteered to become surrogates, with the knowledge that MDS will kill them, but their sacrifice will save the human race. Jessie, not knowing how else she can make a difference in the world, decides that she will sacrifice herself and become a surrogate. The reason her father has locked her up, is because although he was in favour of this idea in theory, he doesn’t want to lose his daughter. This book will leave you with a lot to think about. It would make a great book club book, or novel to use for Year 12 study, as there are so many issues to talk about.